"All our love, The Bones Clan"
"Thank you, Mark, for being a friend to us for so many years. Rest in peace until"
Scott leanne and kids Leonard Mark was a big heart and is going to be missed by me & my family and all of the people he cared about..
"Mark you will be missed by so many and by us also cuz!! I am sad and happy in th"
Mark was a big heart and is going to be missed by my me & family and all of the people he cared about..
"Rest in peace Mark! " "Rest with the angels my darling son." "My deepest sympathy to Marks family and friends. Taken far too soon. 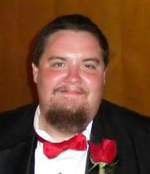 My thoughts"
Mark David Leonard, 33, of Acton, MA, formerly of Bedford, MA, died suddenly Saturday July 7, 2018 at his home. He was the beloved son of Cheryl B. (Goldstein) Leonard and the late John Joseph Leonard, and was the brother of Meredeth “Meff” Leonard and her partner Eowyn Evans of Salem. He is also survived by aunts, uncles, cousins and many friends. Born in Newton, Mark attended the Bedford schools. He was most recently employed seasonally as an actor at Witches’ Woods in Westford.